Groundwater Assist extracts pertinent groundwater data from raw lab data files and adds it to historical data in Excel tables or other types of databases. Thus, each time you sample, you avoid tedious data entry. 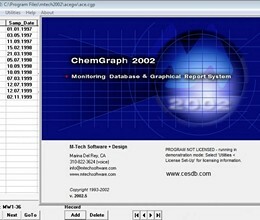 ChemGraph is an Access database and report writer. It enables you to quickly produce groundwater tables, graphs, and maps. 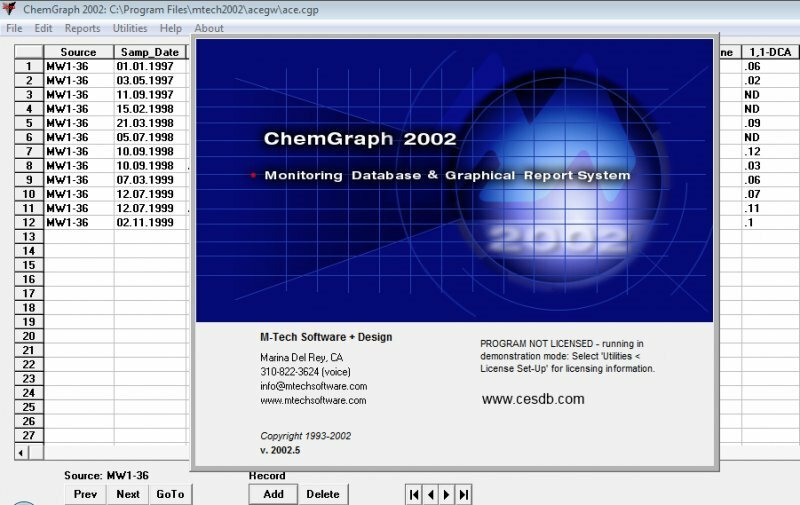 The Source Summary table shows the sampling history data for each source (ex. well, lagoon, etc.). One source is shown per page. You choose the parameters to be shown across the top, and the sampling dates are listed down the left side. The Source Summary graph plots the sampling history data for each source. Each parameter has its own graph with a diamond marker placed on the right side, indicating the maximum contamination level. Viewing the graphs is a great way to scan for trends and anomalies (notice the anomaly for chloride, for example). The Parameter Summary graph, showing just one parameter per page, enables you to compare the values of a parameter between a set of sources. In the example below, the first source is the background source, and the others are compared to it. The Date Summary report shows the plume of contamination for a set of sources during one sampling episode. The report for each episode consists of a table page and up to 10 map pages. The map page shows the sources in their physical locations on the site. Each source area is shaded according to the level of contamination of the parameters chosen. The Date Contour map links directly to Surfer to produce 2-D and 3-D contour maps. Once setup, this process saves hours over using Surfer to manually generate maps. Like the Date Summary report, the Stiff Graph report shows the values for parameters and sources during one sampling episode. The parameters and their scales are shown at the top of the page. Each point on the polygons, below, is placed according to the value for each parameter, relative to its scale, above. Thus, the higher the value, the larger the polygon. This report gives you a way to quickly summarize concentrations of multiple of parameters in multiple sources. The GW Elevation Report shows seasonal trends in groundwater elevations. Up to four sources are plotted together, on one page. * GW Assist download link provides demo version of the software. No one has rated GW Assist yet. Be the first to rate this product.